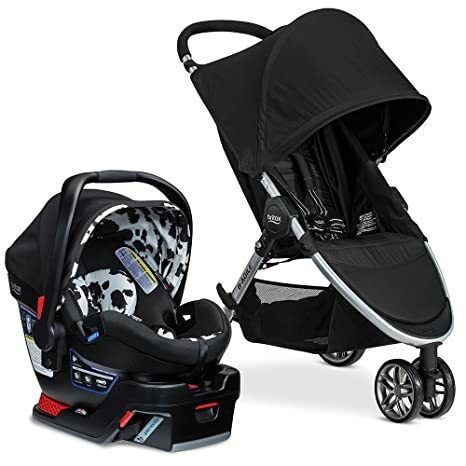 The 2017 B-AGILE & B-SAFE 35 Elite Travel System pairs the best protection with outstanding maneuverability, making it the safest of the Britax travel systems. The combination of incomparable safety of the B-Safe 35 Elite infant car seat and the lightweight maneuverability of the 2017 B-Agile 3 Stroller create the perfect way to maintain your on-the-go lifestyle. The B-Safe 35 Elite infant car seat features the Britax-exclusive Safe Cell Impact Protection system. This integrated system of safety components provides unmatched protection for your baby. These features include a steel frame for strength and a base that compresses to absorb energy during a collision. The extra layer of side impact protection and a deep shell work together to minimize side-to-side movement, resulting in maximum protection Lightweight, maneuverable and simple to fold, the Britax 2017 B-Agile 3 Stroller is easy to carry and navigate. The 3-wheel configuration with swivel front wheels gets you through any tight spots with ease. Quick one-hand fold makes storage effortless. The Click & Go System allows you to combine these two products to create a travel system perfect for busy parents and caregivers. 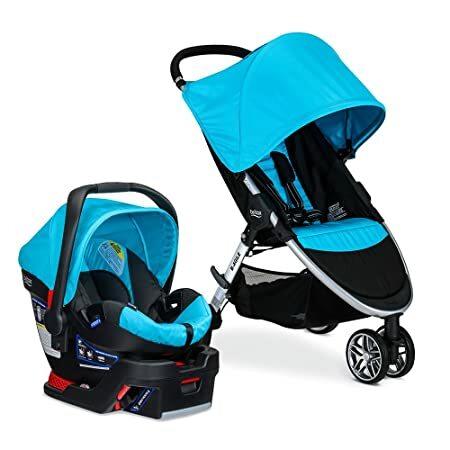 Easily attach the infant car seat to the stroller with just a click, and transitions between car and stroller are fast and easy, allowing you the freedom to keep on moving. The 2017 B-AGILE 3/B-SAFE 35 Travel System pairs the best protection with outstanding maneuverability, making it the smart choice for you and your child. The combination of incomparable safety of the B-Safe 35 infant car seat and the lightweight maneuverability of the 2017 B-Agile 3 Stroller create the perfect way to maintain your on-the-go lifestyle. The B-Safe 35 infant car seat features the Britax-exclusive Safe Cell Impact Protection system. This integrated system of safety components provides unmatched protection for your baby. These features include a steel frame for strength and a base that compresses to absorb energy during a collision. The deep shell takes up less space in your vehicle while also minimizing side-to-side movement, resulting in maximum protection. Lightweight, maneuverable and simple to fold, the Britax 2017 B-Agile 3 Stroller is easy to carry and navigate. The 3-wheel configuration with swivel front wheels gets you through any tight spots with ease. Quick one-hand fold makes storage effortless. The Click & Go System allows you to combine these two products to create a travel system perfect for busy parents and caregivers. 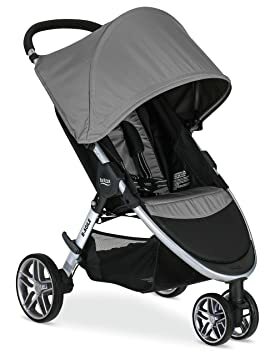 Easily attach the infant car seat to the stroller with just a click, and transitions between car and stroller are fast and easy, allowing you the freedom to keep on moving. Britax’s 2017 B-Ready is the ultimate stroller for families with ever-changing needs. With 12 seating options available, it is adaptable to virtually any parenting scenario. 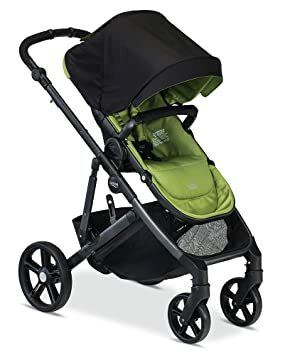 The stroller features a modern look with an elegant slick frame and tires, and the large basket is sized to fit all of life’s essentials and is accessible from all sides. Along with its incredible versatility, the B-Ready has easy one-step folding, even with two seats attached. The B-Ready is safe and easy to adjust. With the Click & Go System, the stroller is compatible with any Britax infant car seat – no additional adapters necessary. It’s also compatible with other major infant car seat brands with a Britax infant car seat adapter (sold separately).Your little one will love the ultra-smooth ride thanks to the foam-filled rubber tires and suspension system. And with a 4-position recline, they can relax in comfort.Parenting is full of surprises – face them head on with the 2017 B-Ready.Strollers manufactured after March 2016. The Britax 2017 B-Agile 3 is the best-selling, lightest and most easily maneuverable stroller so you have the freedom to get where you need to go. The B-Agile 3 won’t weigh you down thanks to its lightweight aluminum frame. Designed with multi-tasking parents in mind, the quick-fold design allows you to close the stroller in seconds with just one hand. The 3-wheel configuration with swivel front wheels is one reason this stroller is a customer favorite. This feature provides an ultra-small turning radius so you easily glide through crowds, thin aisles and other tight spaces. Combine the maneuverable B-Agile 3 with any Britax infant car seat and you get the perfect travel system from the #1 brand in safety technology. The Click & Go System allows for a quick and secure connection – with a set of complimentary adapters packaged with the stroller. The B-Agile 3 is also compatible with other major infant car seat brands with the use of an adapter (sold separately). Britax’s 2017 B-Ready is the ultimate stroller for families with ever-changing needs. With 12 seating options available, it is adaptable to virtually any parenting scenario. The stroller features a modern look with an elegant slick frame and tires, and the large basket is sized to fit all of life’s essentials and is accessible from all sides. Along with its incredible versatility, the B-Ready has easy one-step folding, even with two seats attached. The B-Ready is safe and easy to adjust. With the Click & Go System, the stroller is compatible with any Britax infant car seat – no additional adapters necessary. It’s also compatible with other major infant car seat brands with a Britax infant car seat adapter (sold separately).Your little one will love the ultra-smooth ride thanks to the foam-filled rubber tires and suspension system. And with a 4-position recline, they can relax in comfort.Parenting is full of surprises – face them head on with the 2017 B-Ready.Strollers manufactured after March 2016. Fabric Content- Body: Polyurethane Foam Pad 80, Polyester Fiber Batting 20 Comfort Pads (2): Polyurethane Foam Pad 100 Arm Bar Pad: Polyester Fiber Batting 70, Polyurethane Foam Pad 30.